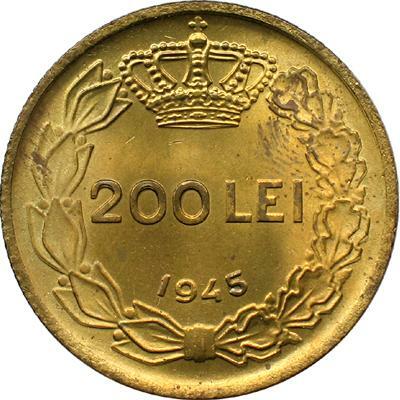 denomination "200 LEI" and year 1945 inside a wreath formed by a laurel branch (left) and an oak branch (right), crown above inscription "MIHAI I REGELE ROMANILOR" meaning "KING OF THE ROMANIANS", MIHAI I head facing right. Under the neck lies H. IONESCU, the engraver's name. These coins were struck at Bucharest mint. The book "Monetele României" (Coins of Romania, Iliescu and Radovici, 2004) the mintage for this coin is assumed to be 20.025.000 pieces, and brass composition is 63% copper and 37% zinc. In MBR the coin is assumed to contain 80% copper, 19% zinc and 1% nickel. 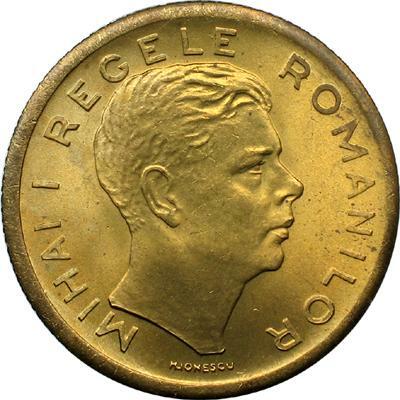 The pictures of 200 lei 1945 are present on Romanian coins through the kind permission of an anonymous donor.